This is a tricky customer! 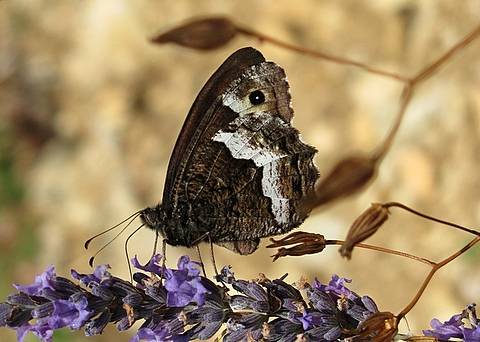 The Rock Grayling is regularly described as being very tough to separate from the Woodland Grayling (H.fagi) and that would seem fair comment and is a problem in 'pairs' from other groups too (e.g. Colias alfacariensis with hyale.) 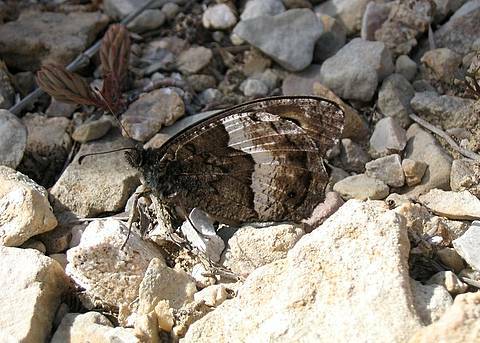 Now, in the Drôme in late July, 2005 fagi was thoroughly common around the 400m mark........it is generally large and quite a variable butterfly regarding the tones and patterns on the underside of the hindwing. 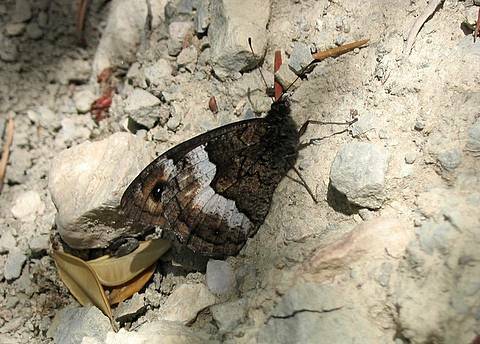 Walking up a hillside I arrived at a corner at 700m with a rocky slope where there were a small group of butterflies which seemed different. They were smaller and darker and were content to rest amongst stones rather than adopt the 'fagi habit' of retreating to tree trunks. I also noticed immediately on these individuals how the contrasting white band on the hindwing had its exterior contour following the movement of the interior one, whereas the zillions of fagi further down the valley had any definable exterior contour in a smoothish curve. 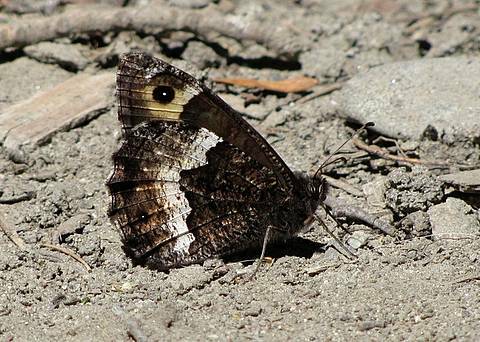 It has since been pointed out to me by a friend who I asked to give an opinion on these photos that alcyone seems regularly to have dark brown 'thumb print' rounded blotches between the veins on the inside of the dark postdiscal line of the hindwing. The combined factors of altitude/habitat/size/colouration/markings are all pointing towards H.alcyone which is very pleasing indeed as I suspect it may be a rather local creature and a fairly difficult species to encounter or at least determine. Within much of its range confusion with fagi will always be inevitable but in areas where fagi is absent (much of Spain/Portugal) it would be useful to gather more information about the habits and appearance of alcyone for comparison.